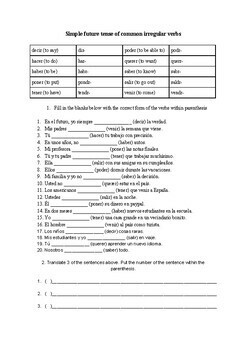 This worksheet doesn't require any prep, you can just print it and hand it out once the students know the simple future tense of regular verbs. There is a chart with 10 of the most common verbs that are irregular in the simple future stem, showing their meaning and the irregular stem. The students fill practice these verbs with 20 fill in the blanks, choosing the stem and adding the future tense ending. About half of questions require a subject pronoun substitution. Finally, students choose 3 of the sentences and translate them. Clear, concise and no confusion guaranteed!